Why is the rum gone? I’ll tell ya why, Jack. We be makin’ rum balls this here fine day. I tell ya true, I found this recipe while rummagin’ around ol’ Davy Jones’s locker. He’s a big fan o’rum, so if you’re hittin’ the high seas, bring a batch o’ these rum balls wi’ ya and he might let ya sail on. Into your food processor add cookies, powdered sugar, and cocoa powder. Pulse on high until well combined. Add molasses, rum, and coffee liqueur, then pulse again to mix well. Add chopped nuts and pulse on low until combined. If you want large chunks of nuts, just do a quick pulse. If you want the nuts ground fine, then pulse until you no longer see the nuts. Transfer the mixture to a bowl with a lid or cover with plastic wrap. Chill in your refrigerator for about 30 minutes so that it can firm up. Scoop the chilled mixture into balls and roll between your palms to form a smooth, round ball about an inch wide. 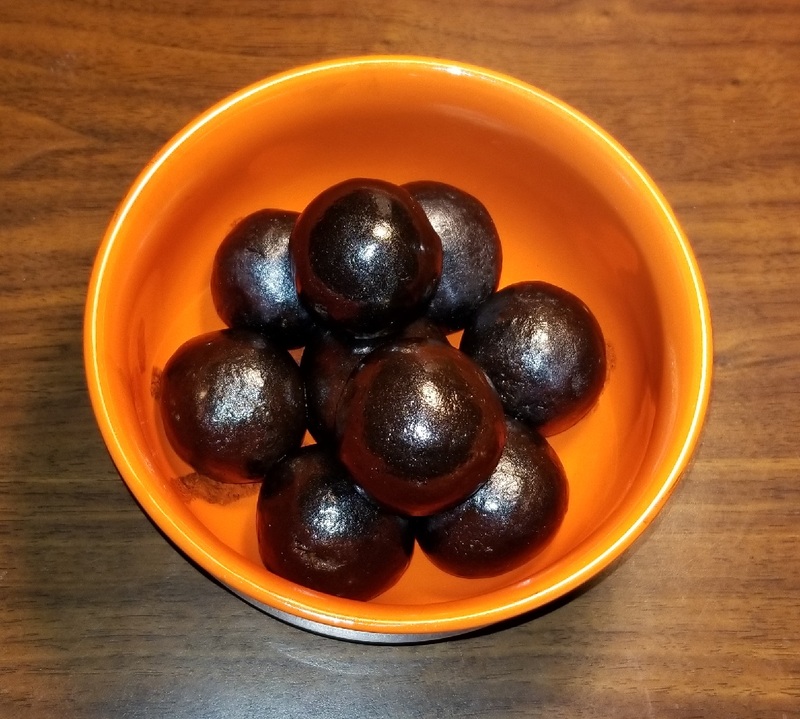 Coat each rum ball with black pearl dust. A little bit goes a long way. Chill the rum balls in an airtight container in the fridge for at least 2 hours before serving. If you don’t have Tia Maria or Kahlua, or don’t like coffee liqueur, you can just use more rum instead. I like Tia Maria because the coffee flavor compliments the chocolate. Sometimes when I make these I use only Tia Maria as it has rum as the base, but the coffee flavor can be too much for some folks. You can absolutely make these without the Black Pearl Dust. It can be hard to find in stores. Furthermore, the dust… gets… everywhere. You will look like a coal miner when you are finished making these with the pearl dust, and your lips and teeth will get a bit yucky, too. On a positive note, they sure are shiny. And tasty! Why are the Rum Balls gone? I eats them all, that’s why.